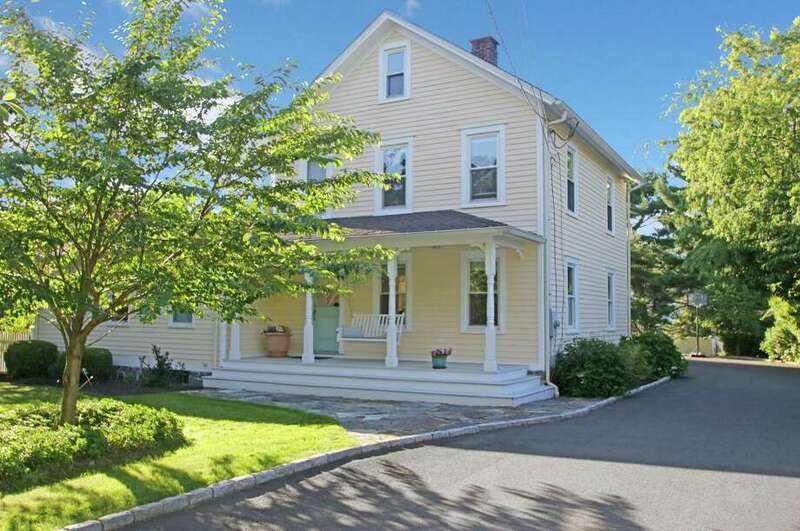 The updated antique colonial farmhouse at 41 Old Road sits on a half-acre corner lot. WESTPORT — The streetscape along Old Road from Post Road (Route 1) to Grist Mill Lane has changed in the last century as, one by one, some of the older houses were razed and replaced with new construction. One of the few remaining recognizable houses on the street is the updated antique colonial farmhouse at 41 Old Road in the Long Lots section of town. The yellow house is a link to Westport’s agricultural roots, and it actually serves as an architectural bridge to the past and present, blending historic elements with 21st century construction and amenities. The Backiel House was named for John S. Backiel, a fruit and vegetable farmer, who built it in 1910. Backiel’s October 1962 obituary in the Norwalk Hour identified him as “one of the area’s larger fruit and vegetable producers,” a charter member of the Bridgeport Fruit and Vegetable Growers Association, and a founder of St. Anthony of Padua Church in Fairfield. The house was thoughtfully restored and expanded in 2003, transforming the early 20th century homestead into a modern-day farmhouse brimming with charm and versatility. While updating the house and increasing its size to 3,691 square feet, the construction team made every effort to keep the original structure’s architecturally distinctive features. Clearly builders succeeded, because this house received a Preservation Award from the Westport Historic District Commission in 2009. “In a neighborhood that has seen a number of demolitions of older homes, the Backiel House now serves as an example of how an older house can regain its charm by returning the architecture to its beginnings,” according to the award documentation from the Historic District Commission. The visual appeal is enhanced by the clapboard of the main house and the board and batten exterior of the attached barn-like two-car garage with barn-style doors and transoms. The garage is topped with a whale weathervane. “We love Westport’s antique farmhouses, especially when they are beautifully restored, updated and expanded like this one, which earned a town preservation award. ... When we sit on the front porch swing, people pass by and tell us how much they admire it. We know the right family will appreciate it as much as we have,” one of the owners said. They also appreciate the convenient location, which is walking distance to Balducci’s gourmet market and Long Lots Elementary School, and only a short drive to the Greens Farms Metro-North train station — only 1.6 miles away, Burying Hill Beach — just under two miles away, and Long Shore Country Club and Compo Beach, both about four miles away. The house sits on a half-acre corner lot, one side bordering Bowling Lane, a cul-de-sac where children play and bicycle. The fencing along one side provides privacy, while the covered front porch allows its owners to sit, relax and interact with neighbors passing by. A long driveway provides ample parking and a stone path leads to the front porch, which features decoratively lathed columns and subtle gingerbread detailing sometimes found on a Victorian home. Inside, the foyer has fluted columns and the rooms feature attractive millwork and molding, and taller-than-usual baseboards. In the formal living room there are two lower-level display shelves. There is a wide entrance from the living room into the formal dining room, the latter of which has a closet that could be converted into a wet bar. In the gourmet eat-in kitchen features include a center island, granite counters, a new chandelier, breakfast bar, large walk-in pantry and high-end appliances — among them a Viking Professional six-burner gas range with a convection oven, plus a second Thermador wall oven, microwave and warming tray. The informal dining area has sliding doors to the stone terrace with a stone sitting wall and yard. This wing of the house also has access to the laundry room, garage and a side door to a covered porch and the driveway. The spacious family room has a cathedral ceiling with exposed milled beams, a floor-to-ceiling stone fireplace and a door to the stone terrace. On the second floor there are four bedrooms. The sizable master suite has a ceiling taller than nine feet, accent lighting, a wall of windows and spacious walk-in closet. Its bath features a marble floor, claw-foot soaking tub, large walk-in shower and double-sink vanity. In the basement there are two finished rooms for use as an exercise room and game or play room. An open house for this property will take place Sept. 9 from 1 to 4 p.m.
estate.com. To make an appointment to see the house, contact Beth Saunders of Berkshire Hathaway HomeServices New England Properties at 203-913-2762 or bethsaunders5@gmail.com.